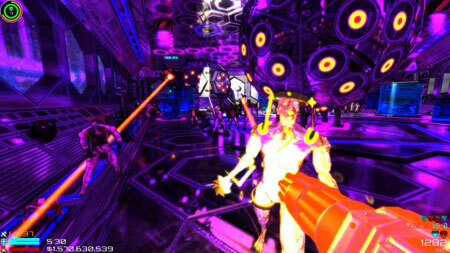 Necro Mutex is a 10,000 levels of chaotic sci-fi horror adventure game by Denormalizer. Choose which maps you play, from super easy to practically impossible. Find the escape pods or just see how far you can get. Take on extra challenges for big rewards, and use those rewards to buy new weapons and survival skills. An Orcus Research Cartel station orbiting a deep space magnetar has gone rogue. The operating system has killed the crew and turned them into thanatoids, half dead monsters with a lust for murder. The corporate A.I. back at Earth System has triggered the station’s self destruct sequence. Your only chance is to fight your way through an army of weaponized undead and find an escape pod, before time runs out or the thanatoids overwhelm you. The maps start small and painless, but sector by sector the challenge mercilessly ramps up, until at some point they become practically impossible. Where that point is depends on your skill. Find the escape pods to complete the game, or just keep going and see how far you can get. If you get stuck in the game, check out the video walkthrough and gameplay for the game. This entry was posted in PC Games, Walkthrough and tagged Necro Mutex Cheats, Necro Mutex Gameplay, Necro Mutex Guide, Necro Mutex Strategy, Necro Mutex Tips, Necro Mutex VR, Necro Mutex Walkthrough by Marvin. Bookmark the permalink.